Nick’s musical background started at 9 years of age playing a range of brass instruments in a marching band. Watching the corps of drums started a fascination with all things percussion which led to years of private study under some of the world’s best teachers, both on drum kit and tabla. Over a 30 year playing career, Nick has played and recorded with countless bands covering almost all styles of music and currently writes and plays in cutting edge groups Linear Sphere and X-Ray Quartet, not to mention countless sessions and sideman gigs. 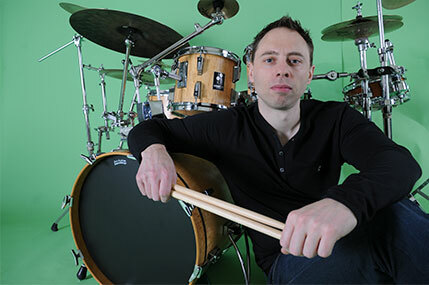 Nick teaches out of a purpose built studio in Wimbledon, South London, which is equipped with two top of the range acoustic Sonor drum kits, and a PA system for backing tracks and sequencers; basically everything needed to prepare the student for any eventuality in their playing career. In over 20 years' teaching Nick has taught literally hundreds of students of all levels of ability ranging in age from 6-70, including working with students with disabilities. Nick believes that regardless of any preferred musical style, all students should develop a well-rounded understanding of the instrument and its application, and additionally develop technique and theory in equal measure. The lessons are designed to be challenging but most importantly fun, enhancing the student’s creativity in the process. For those interested in pursuing grades, Nick has prepared students for drum grades 1-8, GCSE, A-Level, and Degree level studies, all with a 100% success rate. More importantly, many of Nick’s students have gone on to play and record in bands of their own and even start teaching themselves. Nick is passionate about music and driven to ensure that all of his students achieve their goals as musicians, whether it is to play professionally or just learning for the sheer enjoyment of drumming.